Alpaca your bags! 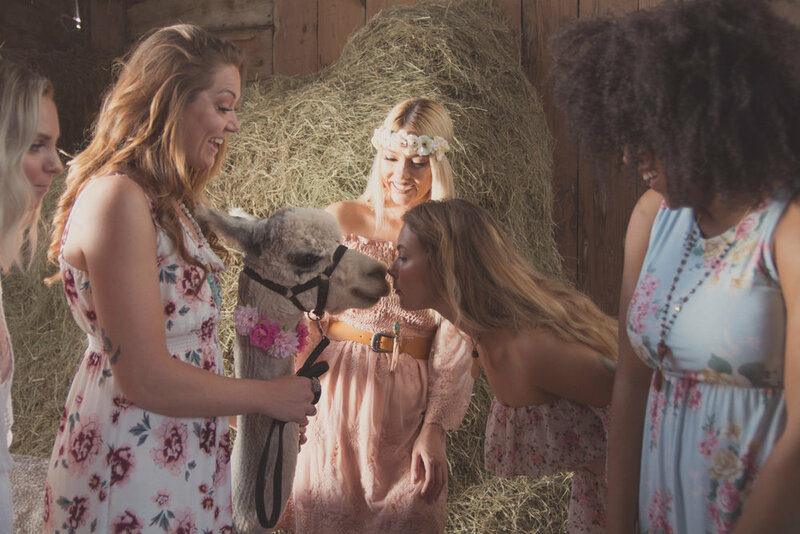 Fashion goes to the farm! 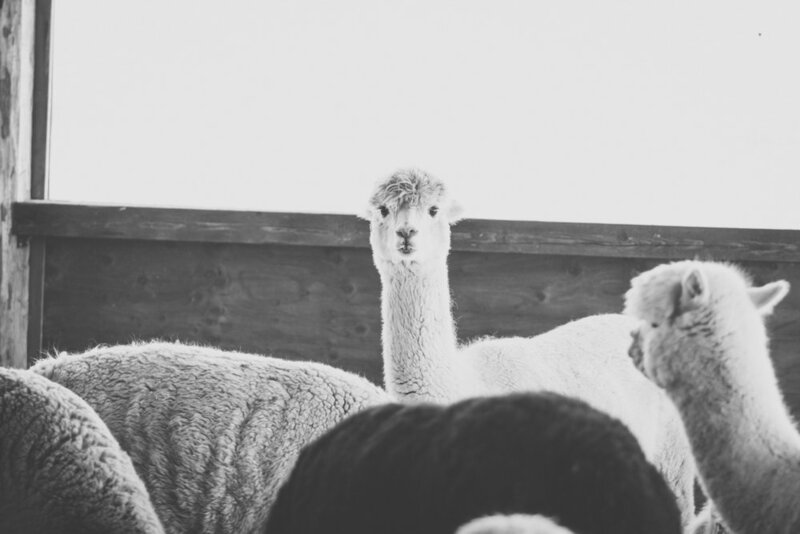 Greetings from De Peres own, Sabamba Alpaca farm! 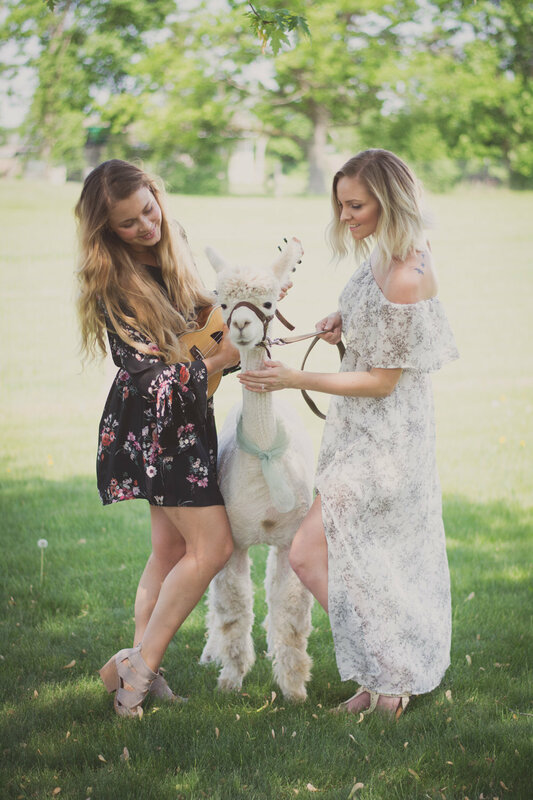 "well, we all knew Laura was weird, so this seems fine"
And you wouldn't be wrong, my fascination with all things kitch has ever expanded to include these enchanting and gentle giants, who, by the way are not to be mistaken for their cousins, the Llama. The difference between Llamas and Alpacas is vast. Llamas are roughly the size of dinosaurs, they carry knives in their fur, and only listen to Black Metal. I joke (Quite often) but Alpacas and Llamas have been bred for over 5 thousand years, originally thought to be in Peru. The size difference between Alpacas and Llamas is noticeable when side-by-side, with llamas averaging upwards of 400 pounds, and being more of a guard animal not bred for their fiber, where as Alpacas are around 250 pounds, are a prey animal, and are known for producing generous amounts of fiber. Because Its my God ordained duty to pull the Fiber from the peoples eyes, thats why! 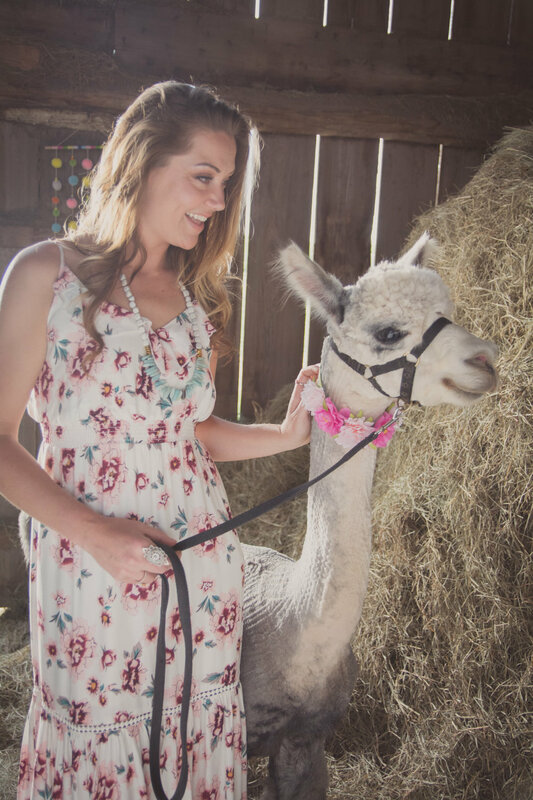 And because in my new found life as a single Mom of 3, I hang out at Alpaca farms..... and that part, is 150% truth. 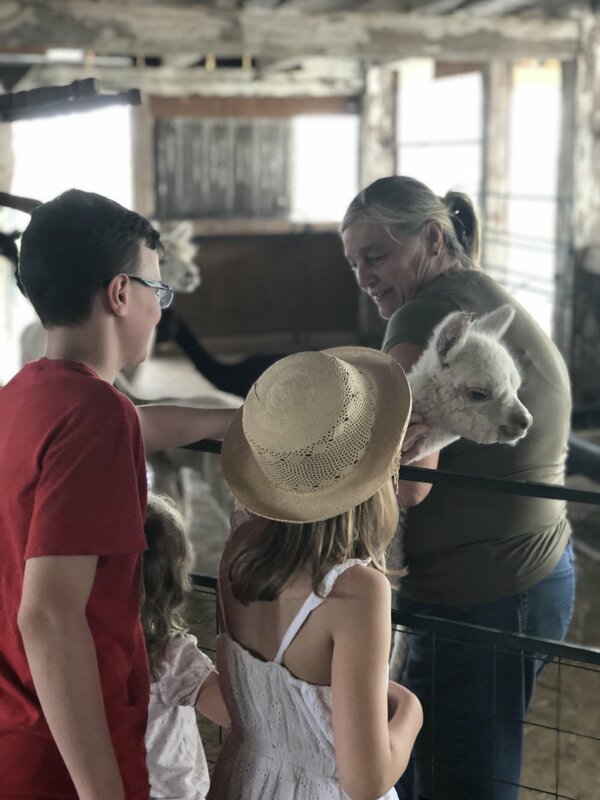 This whole thing started when my family was going through a rough time last year, and in order to bring some cheer into my kids life, My Mother randomly brought them to a local Alpaca farm she had heard about. My kids were hysterical upon entering this barn, looking at these curious bucktoothed creatures. My oldest Son had his phone out taking pictures, and captured what would become legend within our family. Bijou, the cross eyed, slack jawed Alpaca. 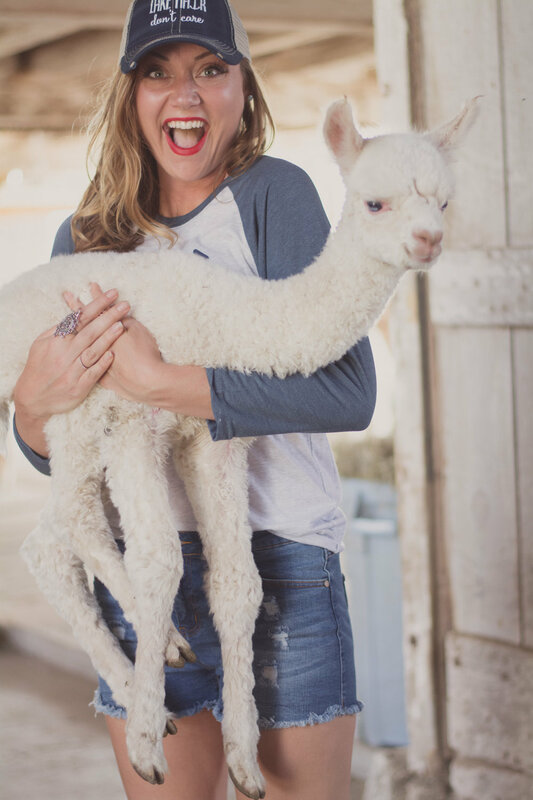 Whenever any of me or my kids were sad, we would continuously pull up this Alpaca, and laugh hysterically. It was a irreverent point of solace, during some rough times. This snapshot in time became an obsession of my youngest daughter, Bea. She requested an Alpaca themed 4th birthday, and even received a painting of Bijou for her room. My relationship with the charming and docile animals about the Sabamba farm have become a place my kids look forward to going to often, and has become a fun quirky thing to bond over, in my already unconventional life as a creative, and new life on my own with my kids. I cannot offer them much, but I can give them once in a lifetime experiences, that bind us together in our new life. 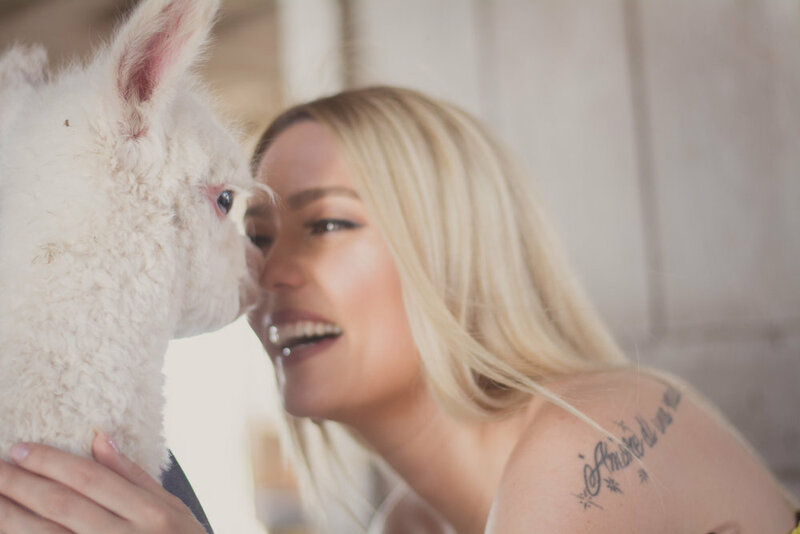 My kids look forward to these hands on experiences, and have been fortunate enough to accompany me to meet the newest baby Alpacas as they are being born. 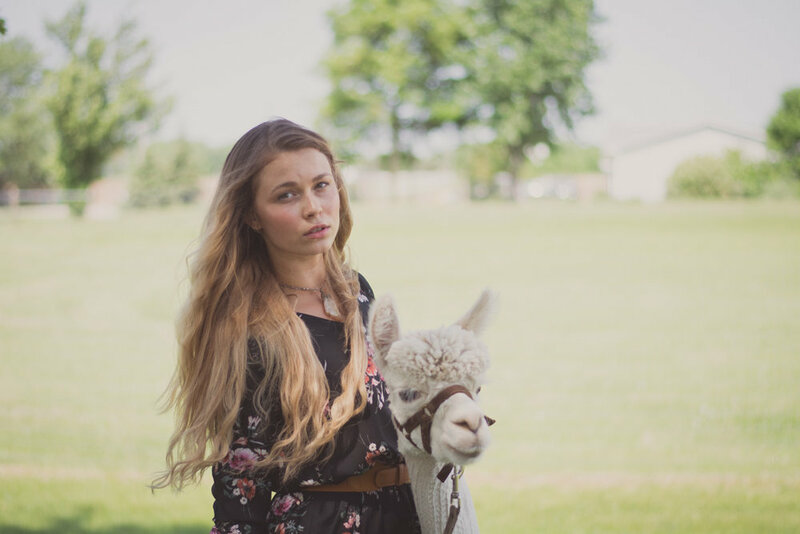 My Middle daughter has even had the honor of having a Baby Alpaca named in her honor, Guinevere! All 3 of my Kiddos, at their favorite place. Farm owner, Sally, bringing 2 -day old Guinevere, to my daughter, Guinevere! 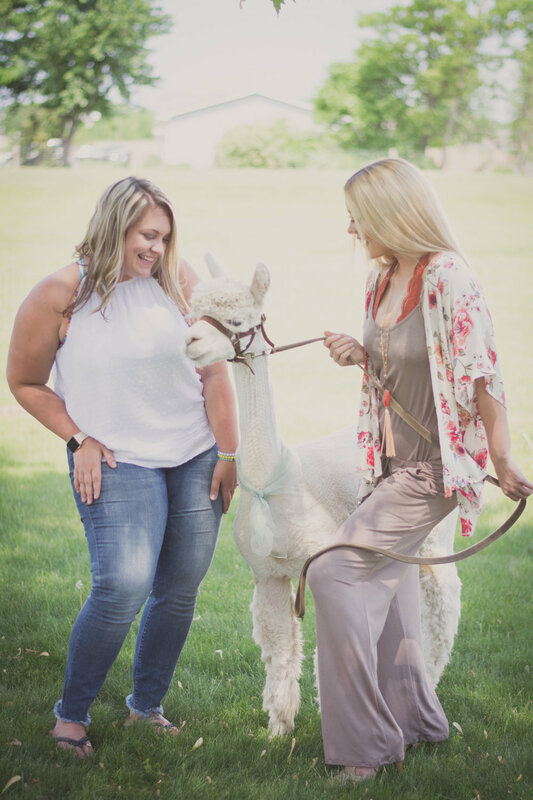 And consequently through a number of events, I came to be contact with the ever gracious and lovely owners of this Alpaca farm, Sabamaba (Which is aptly named from each of the owners children initials) Alpaca Bed and Breakfast. 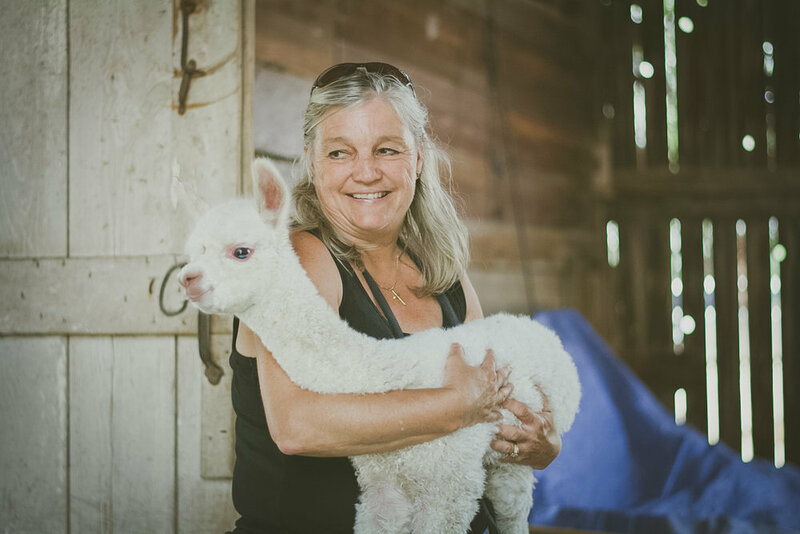 Sally and Tom have owned and bred Alpacas at their gorgeous 1890's Home that double as a Bed and Breakfast since 2006. Their passion for their work, is simply infectious. I found myself often heading out to the farm, because there is always something going on! 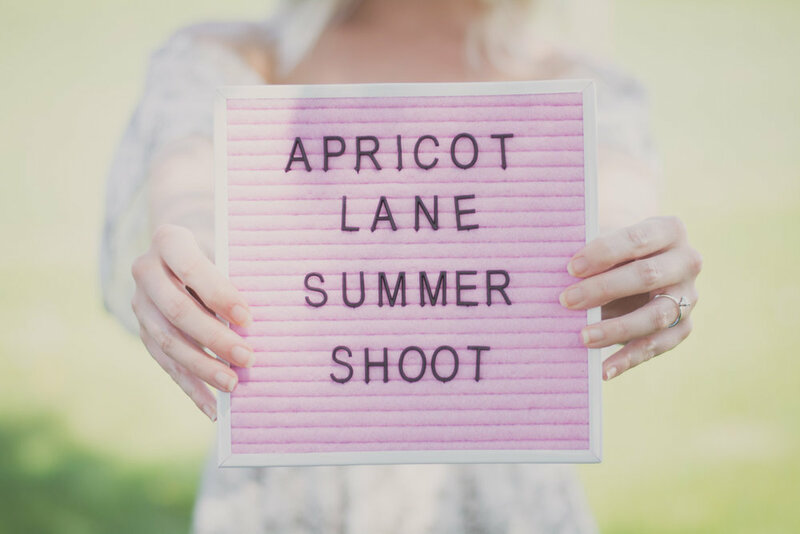 I even found a way to incorporate my work with The Best of The Bay boutique, Apricot Lane into a huge styled shoot, right on the farm! Myself, Sabamba, Kim Verheyden of Apricot lane, and lighting director Nathaniel Haban have been dying to share these images! 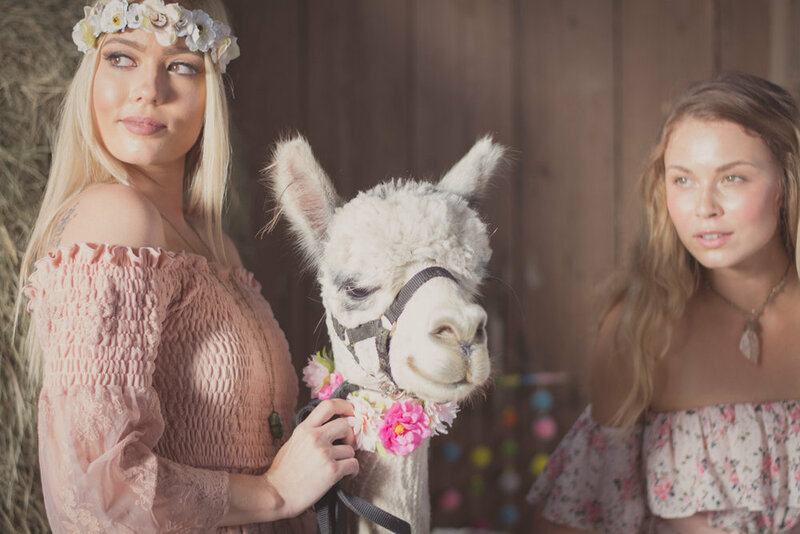 I cannot say enough kind words about the opportunity to pull together this shoot with the models and owner of Apricot Lane, whom are family to me. It was so special to bring things I loved and cared about so much, all to one place and make magic! If you're interested in seeing this place for yourself, Sabamba is excited to have you! Visitors are welcome weekly, Tuesday-Saturday from 10-4. 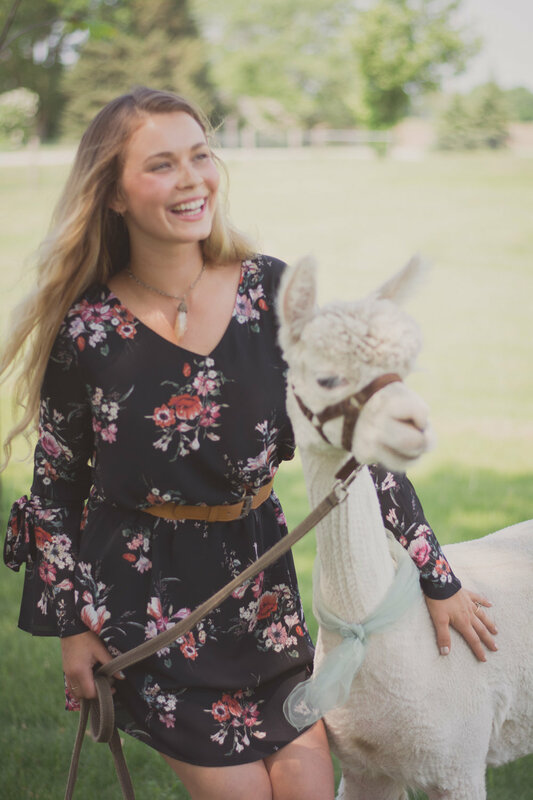 You can meet the Alpacas, and visit their gift shop! 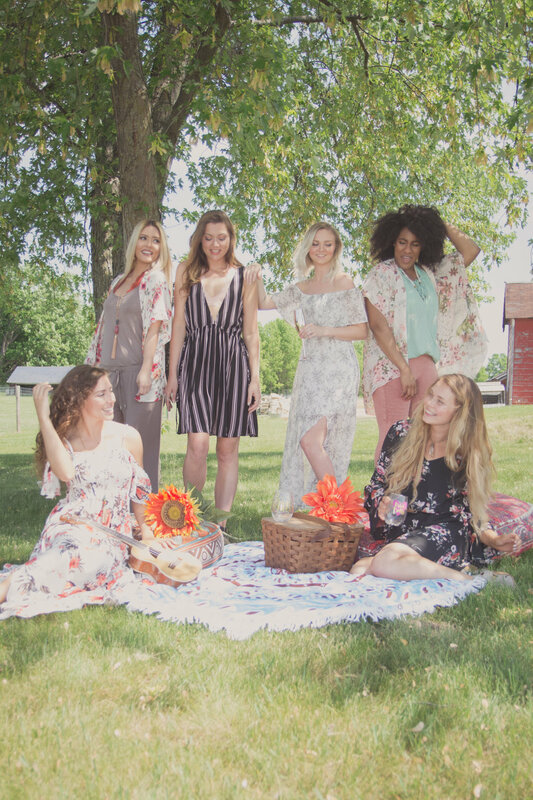 Oh, and uh, because we can, we are pleased to announce a Fall fashion show at the farm, featuring Apricot Lane, this October 6th! Hello there! And welcome back for another round of my Manic Monday series! Thanksgiving is fast approaching, and the Holidays are right around the corner, so ya'll know I am focusing on making sure all my clients got their holiday photos set for loved ones at Christmas time. 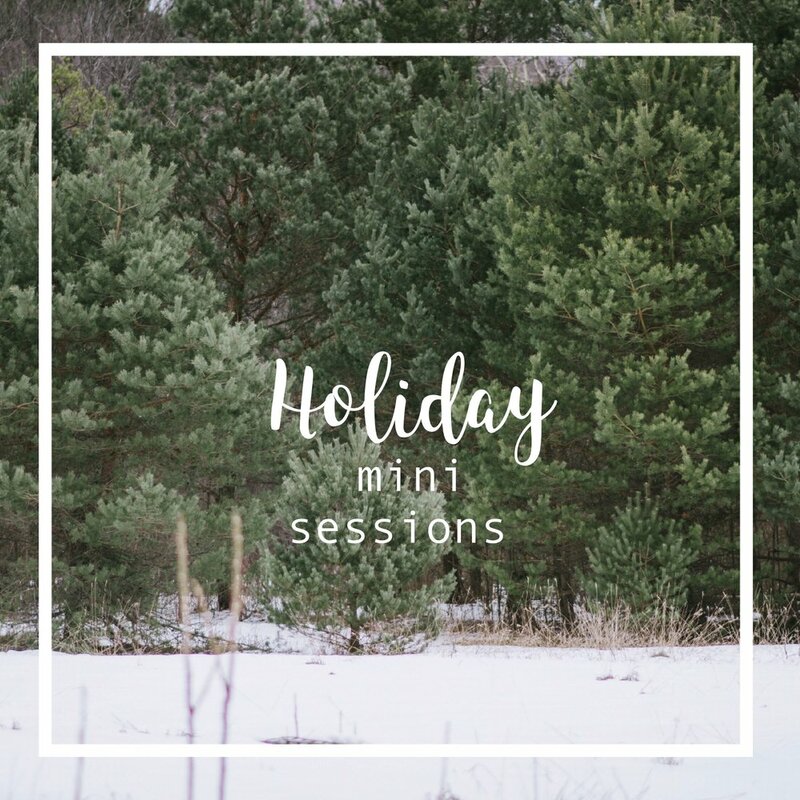 Speaking of, don't forget to contact me to book your Holiday Mini session! I have some slots available this weekend, and will have a fun little Hot Chocolate set up, along with Christmas treats for the kiddos! Hell, I'll probably make sure us grownups have some Christmas "Spirits" as well! Last week saw the official launch of the Apricot Lane Boutique Website, which was a huge, and fast paced project for me. But with the majority of Photos done on my end, It has been really cool to see my photos reaching such a wide commercial audience, and it could not be for a more worthy company! Being the main source of Photos for something as large scale as 3 Boutiques in NE Wisconsin has been an honor, and a privilege. So right now, I am really happy to sit back and be totally bombarded with the massive scale of photos I've curated for this amazing store! I mean, check this stuff out! I've gone commercial, ya'll! Okay, but on the serious, I am excited to have been able to practice my art, in all of its forms, but I am still just as loyal to my clients, and telling their stories. Like Jennifer Lopez, I'm real. This past weekend, I was invited to Celebrate a first Birthday, with the Robinson family, whom is frequently featured in blogs! I have been with them from their wedding, to a miracle pregnancy, birth, and ack, now Little Henley is One! 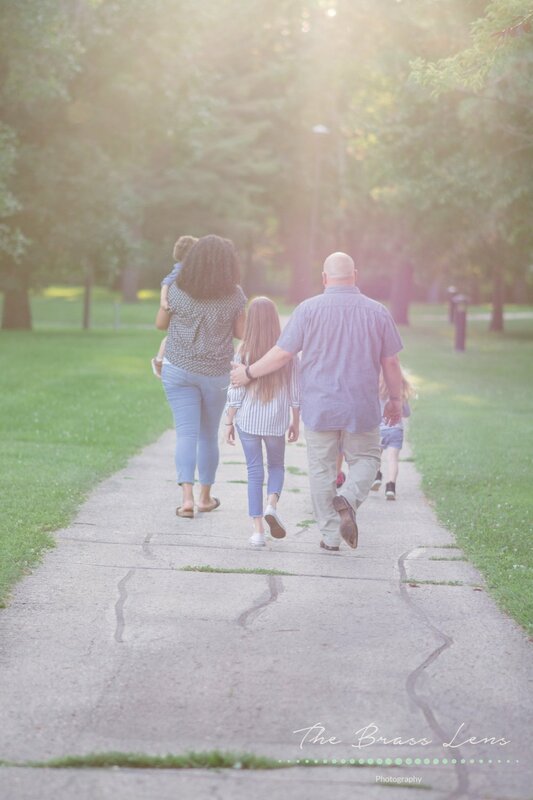 I love my shoots with the Robinson's because they live in the darling little Wisconsin town of Chilton, the drive is 45 minutes from Green Bay, and is beautiful! Chilton has a lot of, I guess what we would call "Old World Charm", and boasts homes and business fronts well over a century old. Henley held her 1st Birthday bash at a local business that her Momma Rachelle, has frequented called Hilde's. 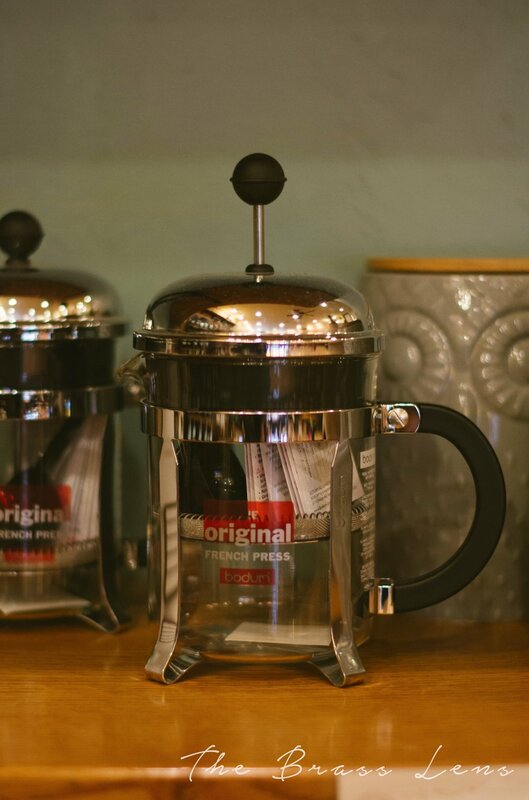 I've become acquainted with this locally owned Business, ran by its Namesake, Hilde, who has created a very welcoming and unique deli that even offers eat in Bistro tables, as well as a room for large special events to be held. 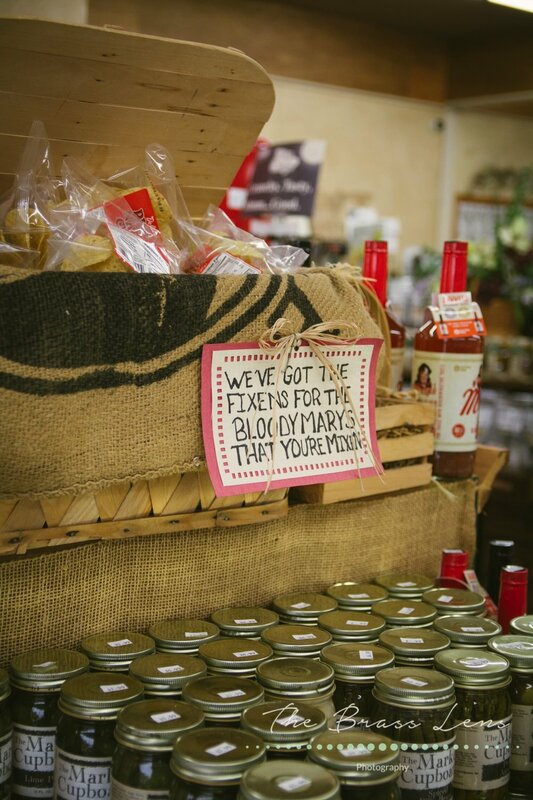 Definitely check them out if you are ever in Chilton, and "like" them on Facebook! Little Miss Henley was showered with gifts at Hildes, and enjoyed her Birthday ca-- I'm sorry, Birthday Steak. You read that right. This kid is after my own heart, she is a tiny carnivore, and I adore her! After celebrating her Birthday, we headed to the Chilton Nature preserve to take Photos of Henley where it all started. Manic Monday: HOT HOT HOT! Welcome back for a long overdue Manic Monday blog! My Manic Monday blog series is a great way for me to sort of catch up with my audience, and share with ya'll some of the work I have been doing, and share tons of exclusive sneak peaks of all the amazing individuals I have been photographing! As I mentioned before, this Blog is long overdue! My Summer has been a whirlwind of some unfortunate personal drama, and even death. I can say with all honesty, that this has been one of the most difficult years of my life; And that if it were not for my family, friends, and my business, I would probably be curled up in a ball outside of The Crisis center! In recognition of the wealth and support I have received from my family, friends and, clients, I am hosting my first annual Customer Appreciation Month, all through out August! You'll be able to book everything from family photo sessions, senior sessions, and even Boudoir, for the lowest rates I offer! If you are interested in booking your spot, please message or call me today! It has been little thing lately that bring me joy, thats the weird thing about going through tough times, it kind of causes you to slow down, and appreciate every moment you got. For instance, I was honored to have been asked to take my dear friend from high-school's family photos. My Oldest Son whom is 12 tagged along on this shoot so he could meet my friend Stephanie and her family. Stephanie's family includes 4 kids, 2 of which she shares with her husband Sebastian, whom is a native of France, along with his 2 who visit from France each summer. I took family photos as I normally do, with the exception of Sebastian acting as translator for his French speaking Daughters. As I wrapped up the shoot and walked to the car with my Son, he looked me dead in the eyes and said, "If those girls don't speak English, how do their parents understand them?" I looked back at him, waiting for him to realize what he had said, and replied, "Oh My Lord, Preston-Kids don't come out of the womb speaking some random language, honey, they live in France!" 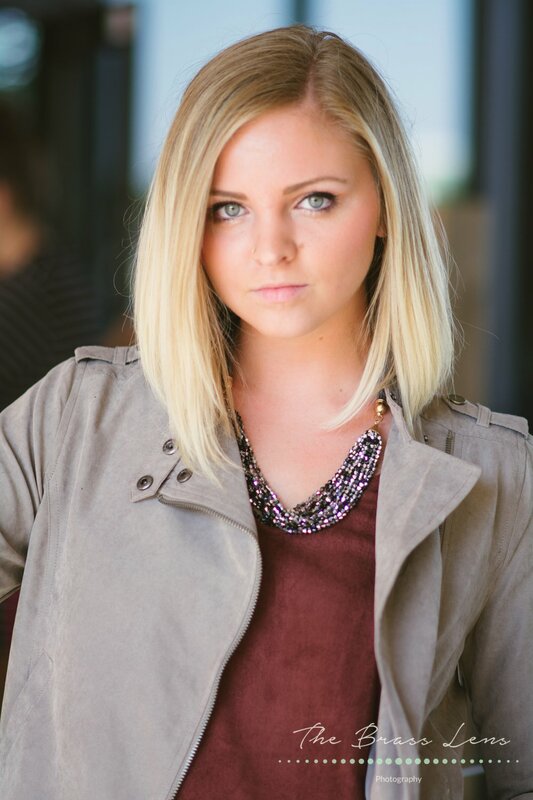 In addition to my family shoots, I have had engagement shoots, and my weekly fashion shoots at Apricot Lane. I have also started the exciting transition into working with small business start-ups. My work with so many different people in the community on a individual basis, has led me to recognize how I have the ability to connect clients, to other local business's, and shine a light on how truly special our community is. And you guessed it, I have previews of all of it! Ya'll have been the Wind beneath my wings, and all that sappy crap. No lie. I ain't too proud to beg. Its true. I would love to lead you to believe that I snagged this phenomenal couple because they reached out to me. 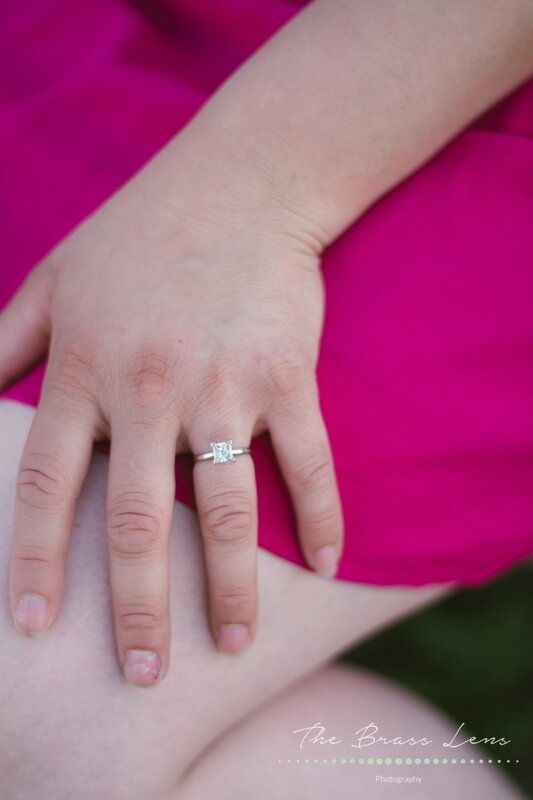 Mindlessly scrolling through Instagram, I see Chelsea, a fiercely beautiful Woman, with Rose Gold Hair, and the most stunning, and Unique custom Engagement ring...... And I basically lured them to my house, doused them with compliments, Craft Brews, and won their hearts. SCORE. Chelsea and Eli Met a few years ago, in Wisconsin's Fox Valley. Both Students at the time, Chelsea and Eli were easily able to relate, Eli being a Film Student, and Chelsea studying Fine Arts at UW Stout. 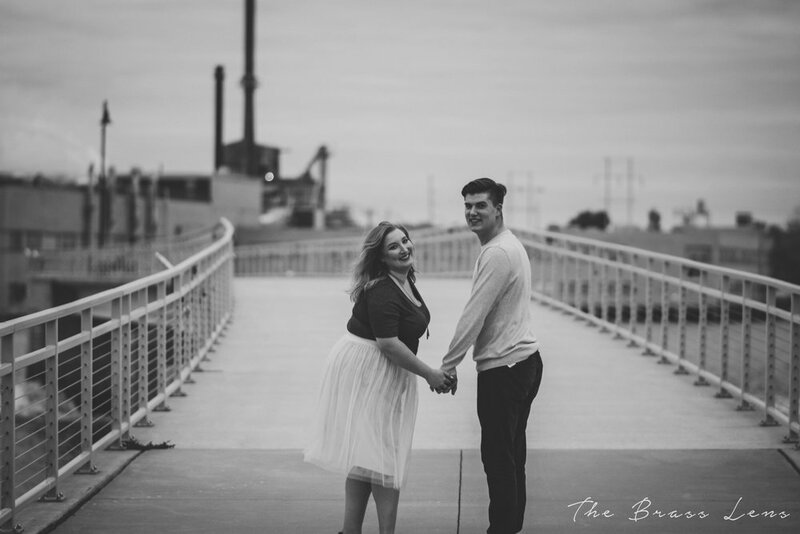 Chelsea and Eli hit it off fast, and quickly acclimated to their life together, moving to Menasha Wisconsin, and Securing Jobs as Potters, at a local Pottery. 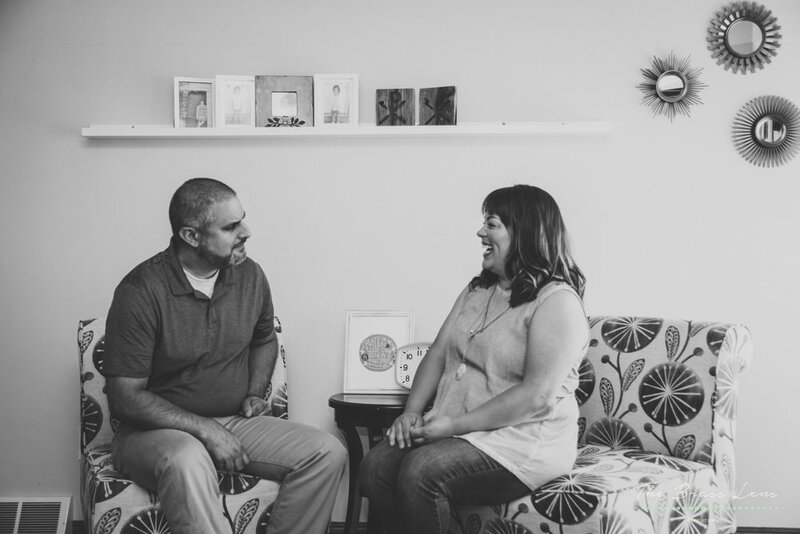 They spent their time together, generally being really, cool, and funny people, So when the question of engagement happened, it just seemed natural to them. I could go on for days about all of the odd quirks I have come to love, in getting to know Chelsea and Eli. But most exciting for me, as a visual Artist, was getting to explore a bit of a departure from typical Engagement Sessions. 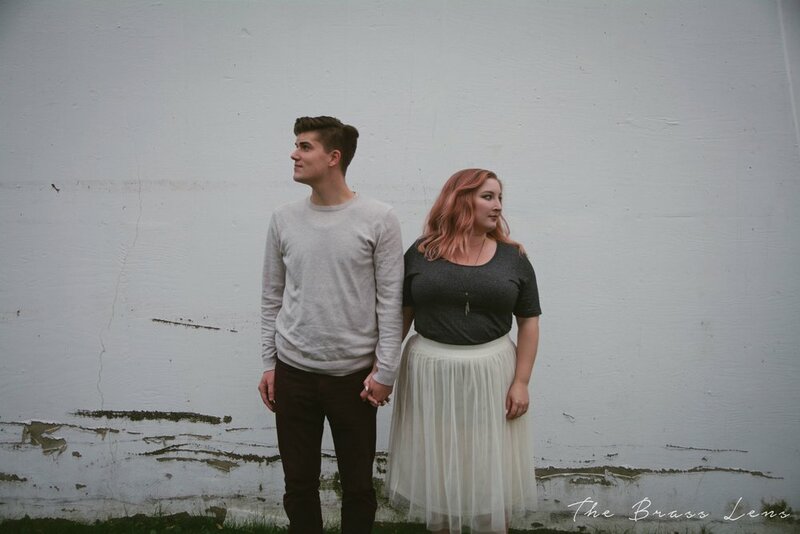 Chelsea and Eli, being artists, deserved to have a Photo set that properly honored their personality, relationship, dynamic, and paid homage to their own background as Artists. 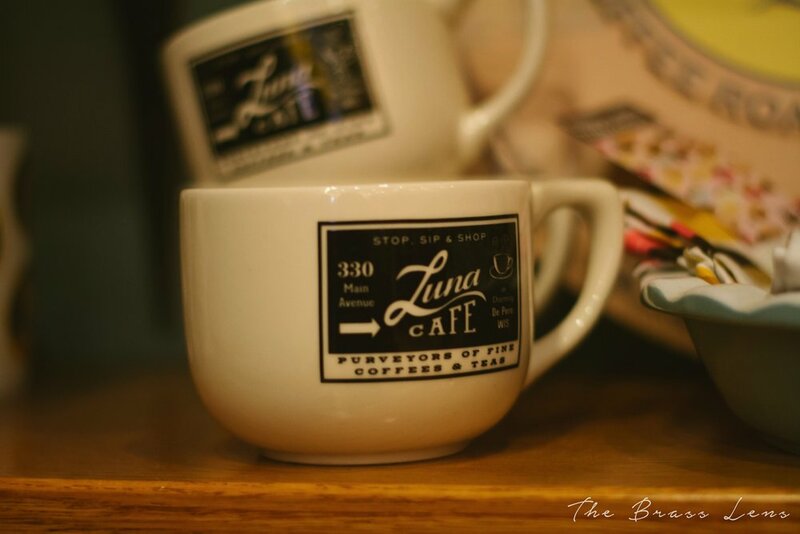 We met on a cold October evening at my favorite Locally owned Coffee Shop, Luna Cafe, in Downtown Depere. We drank Coffee, laughed, and were followed by a Guy in a Top Hat, holding a Broken Uke. We hiked through Depere's beautiful Trail, hitting some of my favorite spots as a the Sun set. It all happened so seamlessly, as if I wasn't actually there doing my job, I was just casually snapping Photos, and geeking out about Art Stuff. The results, are dramatic, moody, and all together Elegant. 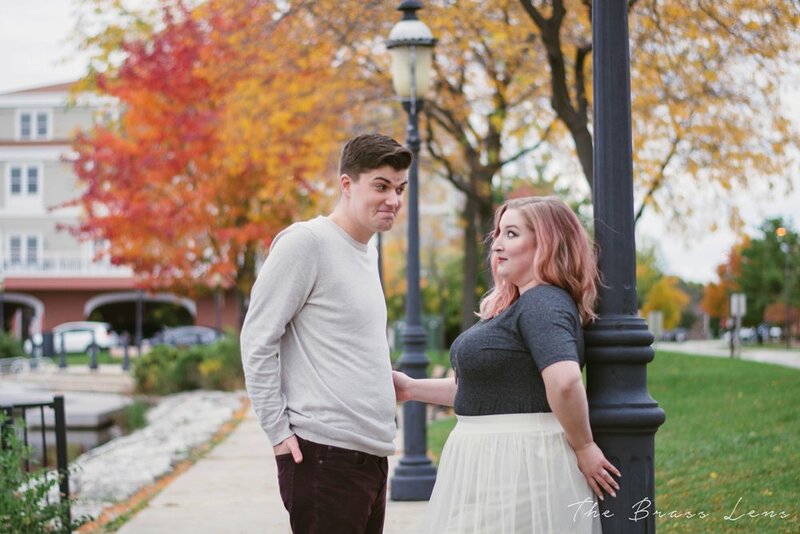 I set out to pay special homage to Two Unique Artists, embarking on life together, and I am so happy when I see these Photos, I just think, "That is SO Chelsea and Eli". I've got bad news for ya'll. The following, will cause you to feel like you probably should throw in the towel for your child's next birthday party. Thats right, this birthday was straight up, BONKERS. It had everything: Cake, candy, Bounce houses, Photo-booths, AND a Cat with a Hitler mustache. Before I gush about the details, (AND THERE ARE TONS) I should preface this lovely photo set, with a bit of backstory. 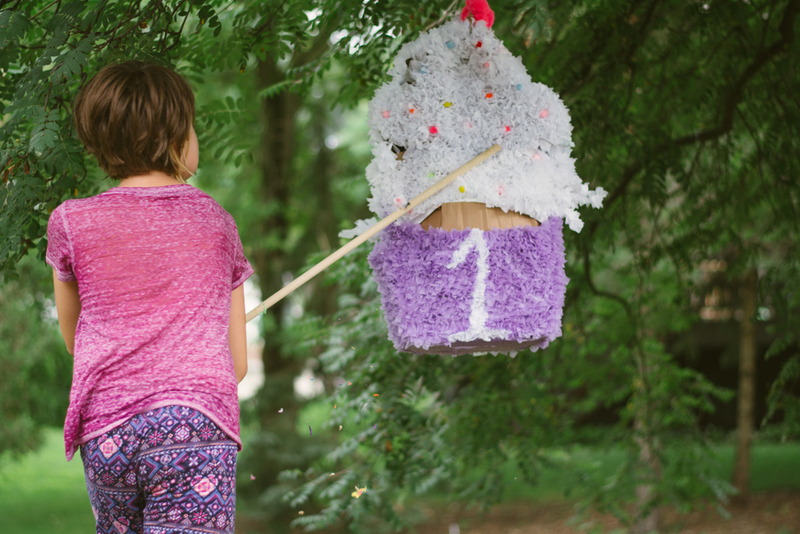 I met Amber, the party planner extraordinaire, 6 months ago, when she hired me to do her daughter, Ryott's photos. 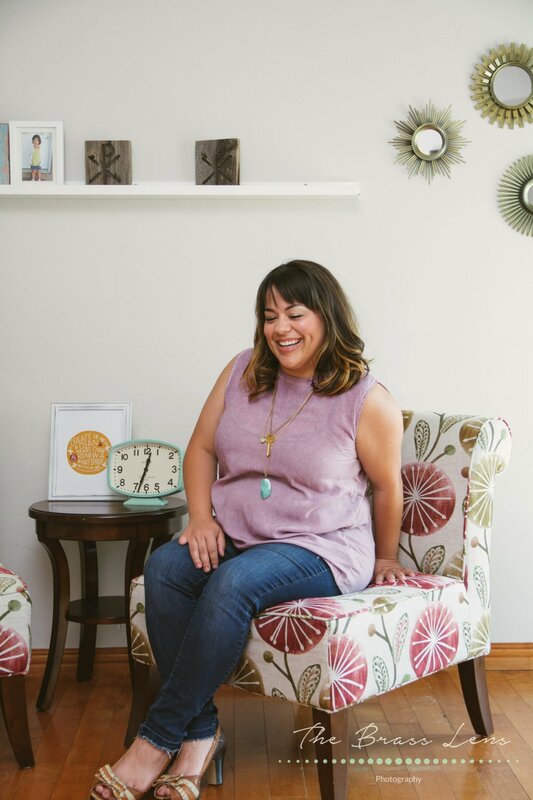 I met with Amber in her home for photos, and we hit it off pretty quick, identifying with our love of all things weird, and the love of our family. It became pretty clear to me, and I think anyone who knows Amber, could tell you that one of the most important people in her life, is her Sister, Sierra. 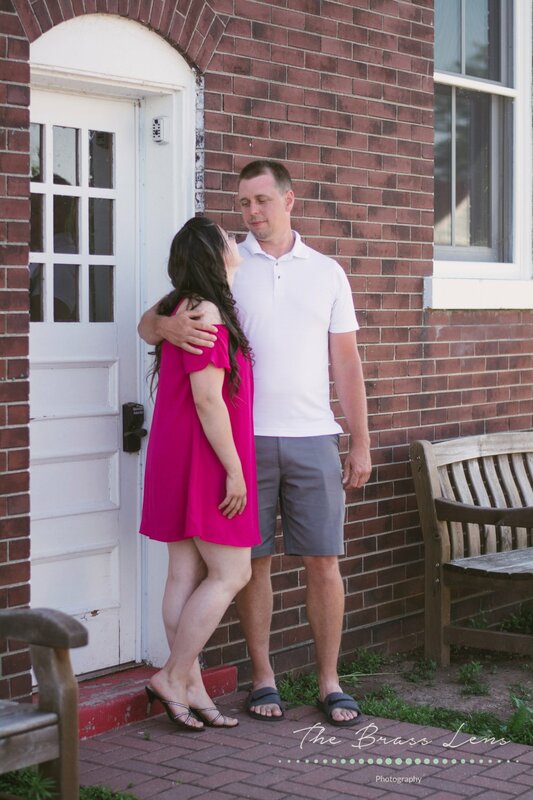 Amber could tell you, that Sierra was more excited than anyone, for Ryott to be born, and was with Amber every step of the way, from her Pregnancy, to Ryott's Birth. As Fate would have it, Sierra was able to indulge in the joy's of being an Aunt for a short period of time, before being tragically killed in a car accident. Heartbroken, Amber did the only thing she could, and that meant that she would keep Sierra involved in her daughters life, even after death. I know this all went downhill really fast, you guys, but there is life, after death. Sierra lives on in a important way, she is even present, at a Memorial Table that Amber intends on putting out for every Birthday. On that Table, is a book, with a hand written note from Sierra, to her Niece. A love letter, from a Aunt, taken too soon. Amber admittedly, through herself into party planning (which, spoiler alert, she started when she was in the hospital giving birth to Ryott, so don't feel too undercut, Mom's and Dads) after her Sisters death. Her Friends took heed, and helped Amber along the way, even driving from Indianna, with a U-haul full of Birthday decor. The hard work, and effort from Amber, her Friends, and some excellent small Businesses paid in Spades. I don't think I have ever seen such a grand set-up for a Birthday, to boot, I have never seen people more dedicated to helping a friend, and celebrating life, the life of Ryott. I am not sure I can speak for everyone, but I can say from my perspective, this wasn't just a Birthday, it was fully loaded with emotion, and love, it was truly a demonstration of the life, and memories a Mother wanted to create for her Daughter...... And knowing all the turbulence that Amber went through to make this happen, honestly choked me up. One thing is for Damn sure, Little Ryott is SO LOVED, she is in for a lifetime of unique experiences, and I am so very happy to witness that. Aren't you OBSESSED with this party? Well, I got the Deets for you, right here! 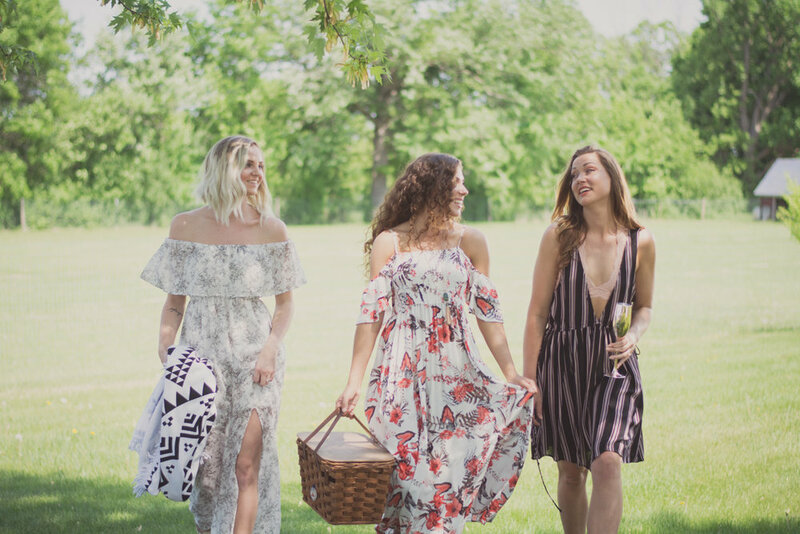 These Vendors did an excellent job in making this party everything Amber ever wanted, and she has absolutely rave reviews about everyone who participated in this special day!